By Jerry R. Caldwell, Esq., an Atlanta-based attorney and former Georgia Tech football player. Jerry specializes in Business Law, Litigation, Trademarks, and Sports & Entertainment Law. Follow him @JerryRCaldwell. Rap superstar Jay-Z has taken over the music world and now he is about to conquer the land of sports agents with his newly-formed Roc Nation Sports agency. Before all of my official hip-hop heads or Jay-Z fans seek to revoke my “black” card, I’m very aware of the lyrics to his song 99 Problems, but I had to tweak it a little to work for my article. Also, before my education credentials are verified, I understand that “ain’t” is not a word. So relax. In the world today, Jay-Z is one of the most famous and recognizable people on the face of this earth due largely to his success as arguably the greatest rap artist ever, countless brand endorsements, owner of the New Jersey Nets (albeit a small percentage, nonetheless an owner), his relationship with the President of the United States, Barack Obama, and certainly last but not least, (certainly my most favorite), his beautiful, talented and super wealthy wife, Beyonce. Everything Jay-Z touches has turned into Diamonds. He has surpassed the “gold” standard. So you ask, what does a man with all of this do for an encore (…Can I get an encore, do you want more..)? That’s right; he bundles up all of his qualities and business savvy that has allowed him to go from the streets of Marcy Projects to the White House and everything in between to pursue a new business venture of being a sports agent. (Insert Jay-Z line, “I’m a hustler baby”… “It’s about to go down”). The sports agency/athlete representation business just got very interesting. If you thought Terrell Owens doing push-ups and sit-ups in his driveway was remarkable, or Drew Rosenhaus standing behind the Burger King mascot saying “Next Question,” Jay-Z’s impact on the sports agency business is going to blow your hat off. Now before you naysayers attempt to compare Jay-Z to Master P., pay close attention to Jay-Z’s decision to secure a strategic business alliance with Creative Arts Agency (CAA). This relationship will serve the same purpose that training wheels serve on a kid’s bicycle. Being a shrewd businessman, Jay-Z always has a support system in place to minimize his risk and increase his chances of success. So if you think for a minute that a Jay-Z (Roc Nation) client will sign an incentive based contract with no guaranteed money as a first round pick like Ricky Williams did, think again. Here we a have a cultural icon, music mogul, rap star who just so happens to have one of the brightest business minds. So let’s put this into perspective. Athletics and the world of entertainment are so closely connected. Couple that with the desire of athletes wanting to be a part of the larger-than-life persona, “Jay-Z” and his celebrity-filled world, athletes will likely shun all other suitors for an opportunity to sign with Jay-Z and Roc Nation Sports. Right on cue, with less than six months in the sports agent game, Jay-Z has shown that he will be a force to be reckoned with as evidenced by the signing of NFL QB Geno Smith, WNBA’s Skylar Diggins, MLB’s Robinson Cano, and (drum roll please…) the recent signing of non-other than superstar NBA player Mr. Kevin Durant. If Jay-Z didn’t have agents’ attention, signing Kevin Durant is sure to open up a few eyes. 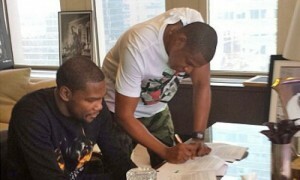 Newly minted agent Jay-Z signs NBA All-Star Kevin Durant (left) to Roc Nation Sports. 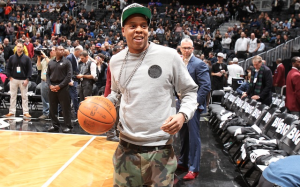 Furthermore, in my opinion, Jay-Z’s entry into the athlete representation business will force many of the veteran sports agents to change their “selling message” to draft prospects. The message of “he’s an inexperienced agent” and “I know the owners of the professional teams” will almost definitely fall upon deaf ears. Jay-Z on top of being “Jay-Z” is a brilliant business man and possesses formidable business alliances such as his relationship with CAA. I anticipate the message from other agents will be along the lines, “if you sign with Jay-Z (Roc Nation) you will likely just be a number.” In the words of my mother, “Mark my words,” Jay-Z will face scrutiny by other agencies and/or agents in attempt to level the playing field. The day that Jay-Z signs away another agent’s top player legally or signs the first 10 picks of the draft, other agents will come together to keep Jay-Z from taking over. In my opinion, this is evidenced by the recent announcement of the NFLPA probing into Jay-Z possibly violating the “runner rule” of the Collective Bargaining Agreement (CBA). I laughed uncontrollably for a few seconds because I couldn’t believe what I was reading. Really??? If the “runner rule” is truly going to be enforced, any such probes could have been initiated long before Jay-Z arrived on the scene. However, if Jay-Z is deemed to have violated the NFLPA’s “runner rule” in the Collective Bargaining Agreement (CBA) it could potentially thwart his aspirations of becoming an NFL Certified Contract Advisor. Literally, he may not be able to sit at the “table” and negotiate player contracts, however his impact will still be felt because there is always the marketing arm that is enticing to players and yields a helluva lot more money. Either way, Jay-Z will still be “WINNING”! In fact, probing a violation of the “runner rule” should be the least of the NFLPA’s concerns when so many athletes are represented by “certified” NFL agents and financial advisors but yet so many of them end up BROKE! That is another discussion for another day. I will sit in the background and cheer for the success of Jay-Z because it would be a classic case of “beating them at their own game” because in the words of HOVA himself, “I (he) will not lose.” His repeated success has proven that he’s a winner.